Deja View was imagined as a classic Hollywood-style narrative with a twist. To better demonstrate the Q50’s unique personalization features, we’d let the audience participate in an ever-changing story, affecting the characters’ actions and reactions through natural language interaction: real-time phone calls. 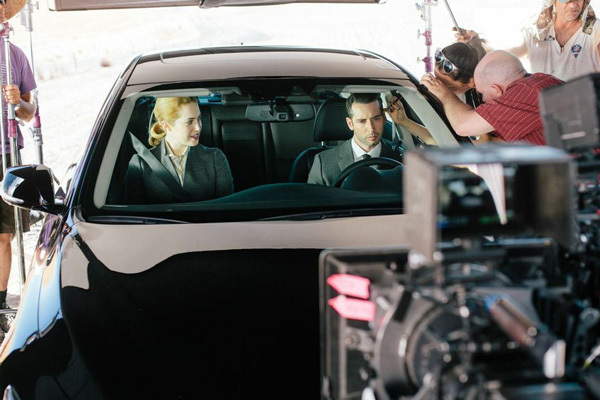 The process began with a seven day shoot in Portland, Oregon, using three RED Epic cameras and shot by Tree of Life second unit DP, Peter Simonite. Andrew Pastides and ABC Rookie Blue‘s Charlotte Sullivan star as a couple who wake up on the road with no memories and a puzzle to solve. Our shoot combined multiple scenes and locations and hundreds of different lines and performances. The edited scenes are connected to a VoIP telephone server and Nuance voice recognition technology. Once the viewer’s phone is connected to the experience, the ensuing conversation with our actors edits the video timeline on the fly into one of thousands of possible combinations. Even the specially-composed music dynamically changes each time to match the action on screen. Available only on the Infiniti web site, the unique nature of the Deja View experience paralleled that of the Q50 itself, a car that changes and adapts its highly-customizable ride to every person that sits behind the wheel. 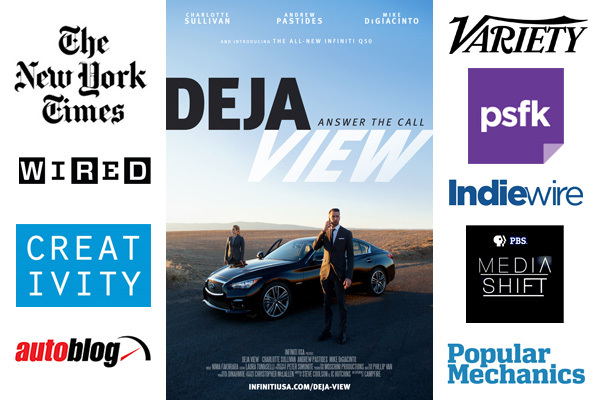 Deja View has been hailed as a breakthrough twist on the interactive movie, amassing vast press coverage with over 80 articles including New York Times, Variety, Wired, Details, and a feature on Google’s Creative Sandbox — generating over 100 million PR impressions. Nearly 20% of unique visitors who began Deja View completed the immersive experience, spending an average of 12 minutes on site. Deja View is no longer available to the public, but can be experienced on a private, password-protected area. Please contact me directly to request access.